The Army Ten-Miler will lead to road closures and transit changes in D.C. and Virginia Sunday. Find out what's changing. WASHINGTON — Roads in D.C. and Arlington will close Sunday morning and early afternoon for the Army Ten-Miler. Metro service also will be impacted. The race starts at 7:50 a.m., and the Arlington police said the course has changed this year. 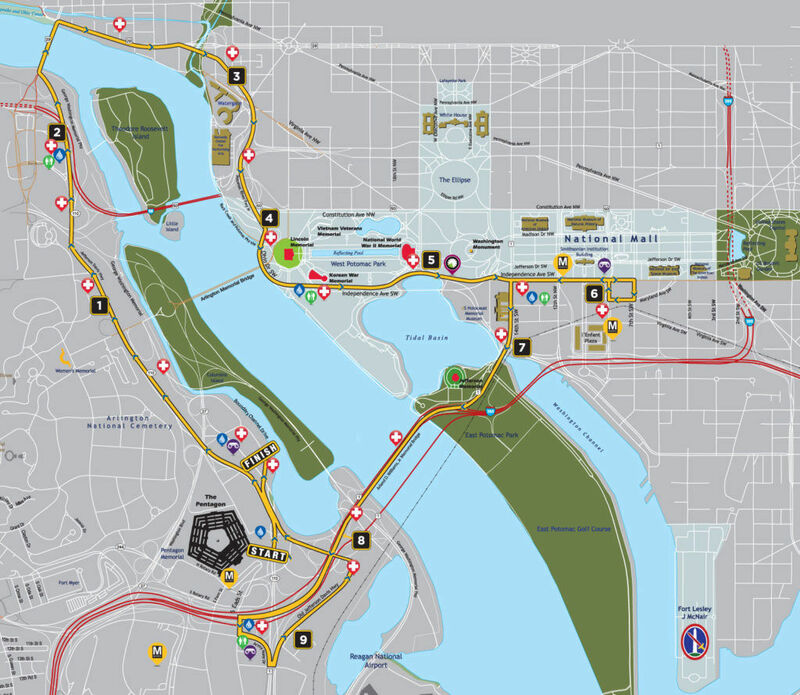 It starts on Route 110, goes into Rosslyn and over the Key Bridge to the Whitehurst Freeway into D.C., along Ohio Drive and Independence Ave before turning around behind the Smithsonian castle and heading behind the Jefferson Memorial back into Virginia. Route 110 between Rosslyn and Crystal City will close in both directions from 5 a.m. to about 2 p.m. The George Washington Parkway is an alternative route. There will be no access to southbound Route 110 from N. Marshall Drive, and you can get to Arlington National Cemetery from N. Marshall Drive. I-66 westbound from D.C. to N. Nash Street will close from 5 to 10 a.m. Drivers can use the George Washington Parkway or Route 50. Lee Highway at N. Lynn Street will close from 5 to 10 a.m. The Key Bridge will close in both directions from about 5 to 10 a.m. The northbound I-395 HOV lanes will close from Crystal City to the 14th Street Bridge at 6 a.m.
Eads Street will close from Army-Navy Drive into the Pentagon/northbound I-395 HOV lanes at 5 a.m. The I-395 southbound HOV exit to the S. Eads Street/Pentagon South parking lot will close at 5 a.m.
Route 27 will close in both directions between George Washington Parkway and I-395 from 7 to 10 a.m.
Army-Navy Drive will close from S. Eads Street to S. 12th Street from roughly 8 a.m. to noon. 12th Street from S. Eads Street to Long Bridge Drive will also close from about 8 a.m. to noon. Long Bridge Drive will close from S. 12th Street to Boundary Channel Drive from about 8 a.m. to noon. Metro will start running trains at 7 a.m. — an hour earlier than usual for a Sunday — and have additional trains on the Blue Line. Metro said the closest station to the starting line is Pentagon (which will be exit-only from 7 to 9 a.m.), but that you may be better off getting off at Pentagon City and walking. Actually, you may not have a choice: If the Pentagon station is too crowded, Metro said trains might go past it. They’ll also run extra Blue Line trains between Franconia-Springfield and Stadium-Armory between 7 and 8:40 a.m., and again from 11:15 a.m. until 12:50 p.m.
As with all large public events, you should make sure you have a SmarTrip card with enough money on it to get you through the day, Metro said — you don’t want to be stuck in line at a fare machine. That goes for the buses too. All Metro buses that normally go to the Pentagon station will go to Pentagon City instead.